Under Drake's Flag is an amazing audio drama from Heirloom Audio Productions. Under Drake's Flag is based on the novel by G.A Henty. We roadschool more than we homeschool so I am always on the search for educational music and audio stories for my children. The entire family enjoyed going on an adventure with Under Drake's Flag on our most recent trip to Myrtle Beach. What better way to start off a beach vacation than with a story about the sea! The set we received included 2 CDs, a study guide booklet and a pdf study guide curriculum. If you listen to both CDs straight through (which is what we did) you will enjoy 2 hours of exciting, engaging entertainment. 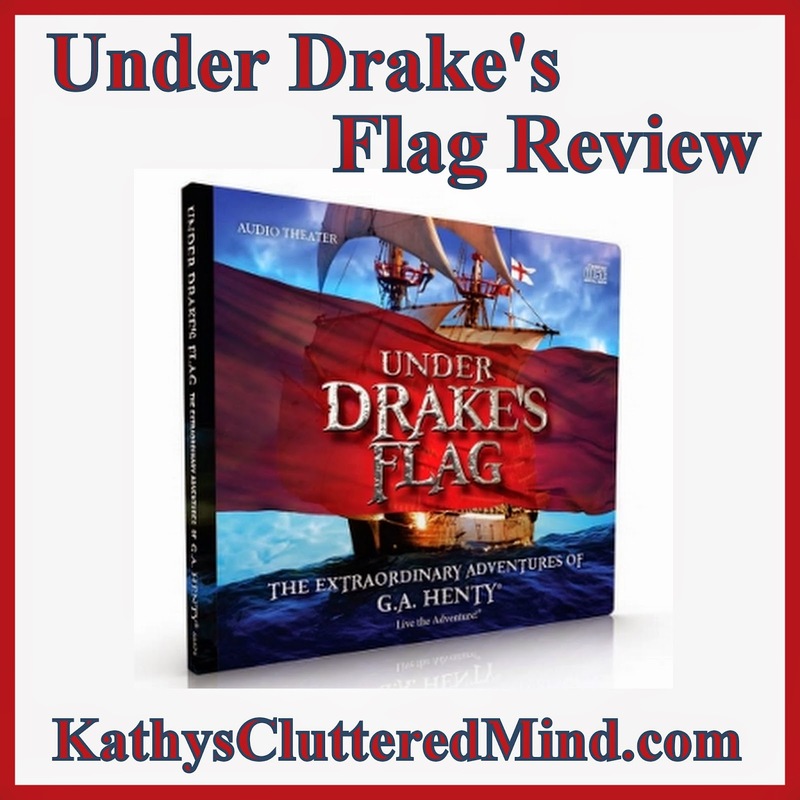 Under Drake's Flag is great for entire family and is recommended for children ages 6 years old and up, though I could see slightly younger children enjoying it too. Under Drake's Flag is not an audio story, or an audio drama it is an active listening audio adventure! Audio theatre is a little different because it is, "fun, entertaining and engaging and allows children to tap into, exercise and build their imagination by letting them create their own self-generated visual images and mental movies." You will be on the edge of your seat as you set out on an adventure aboard The Golden Hinde with Ned Hawkshaw, Gerald and Sir Francis Drake, one of the most celebrated heroes in history. There are shark attacks, shipwrecks, fierce land and sea battles and more. My favorite thing about the Under Drake's Flag besides the fact that it based on true events is that it teaches children many important lessons, values and morals. Children will learn about history, bravery, selflessness, courage, valor and more. The shark attack was the children's favorite part. My favorite part was escape from the Spanish Inquisition. Are you ready for an adventure on the high seas with one of the earliest pirates? Henty's stories do have a Christian focus, but even secular families will enjoy listening to Under Drake's Flag and will be able to take away lots of great historical information and important morals. The production quality is magnificent. The fast-paced dramatization was recorded in London and features fantastic actors, including Brian Bless an acclaimed British actor. The musical score was written by Emmy-award winning composer John Campbell (Lamplighter Theatre®, Focus on the Family Radio Theatre®, Adventures in Odyssey®) . The face-paced script is very engaging and both of my children (ages 8 and 7) were completely captivated by the story. The sound effects and music really enhanced the story and made it feel as though we were watching a movie. To further enhance the audio theater production each CD set comes with an abridged study guide booklet. In the booklet is a link to the complete study guide curriculum which includes even more information for helping your children understand the storyline and principles it teaches. This booklet and study guide curriculum contain questions for discussion, vocabulary and a Bible study linked to the story. Under each chapter there are three sections, "Listening Well", "Thinking Further", and "Defining Words". Since each chapter in the story is numbered on the CD it is very easy to stop at your convenience to utilize the study guide. Example of study guide curriculum. "Listening Well" contains questions to make sure children are listening to the story. They will be asked questions to see what they have heard or what they remember. "Thinking Further" questions help your child utilize their critical thinking skills. Children will be asked to look up something they heard in the story, draw conclusions from characters' actions, or to speculate about intentions, mindset and character. "Defining Words" provides a list of vocabulary words that children may not be familiar with. At the very end of the study guide are 3 brief Bible studies to help your children understand godly character traits. In the back of the pdf study guide curriculum there are also recommended resources for further exploring on Francis Drake. Since we were traveling we listened to the entire story straight through and later when we arrived home discussed the questions and vocabulary. The children inevitably forgot parts of the story (or so they said) so we had to listen to it again at home on a rainy day. We snuggled up on the sofa and went through the story slowly pausing for the discussions. 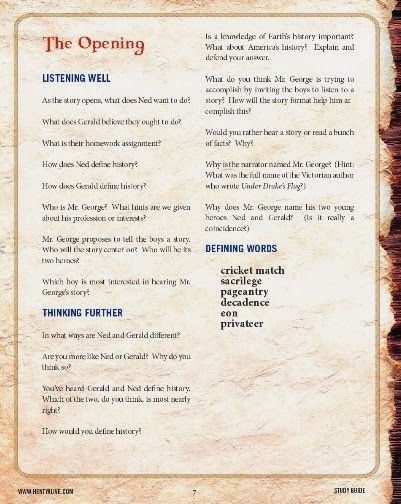 This audio drama set is a great way to liven up history lessons and really bring them to life. Under Drake's Flag is one of the best audio dramas we have ever listened to. It is fun, engaging and great for the entire family. It is definitely one that we will listen to multiple times. The accompanying resources further extend the amazing audio story helping you create a fantastic mini history unit study on Sir Francis Drake (a 1500's explorer), the Spanish Inquisition and even slavery. 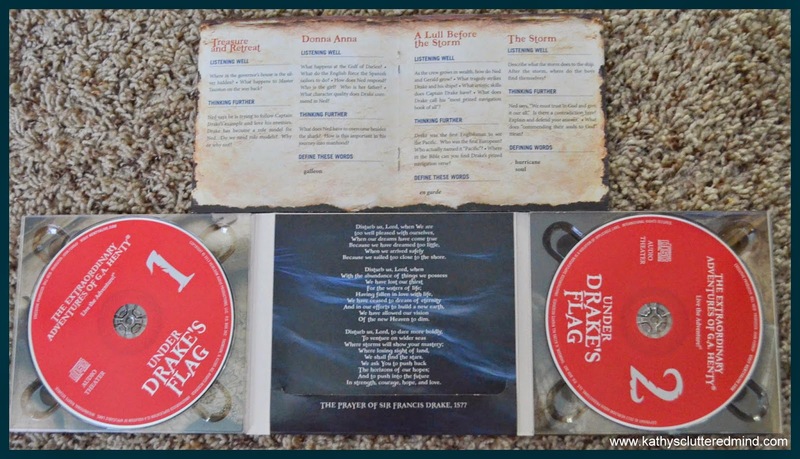 The Under Drake’s Flag, 2 CD set is $29.95 (physical CD set) there are other pricing options are available. In November Heirloom Audio Productions will be releasing a new audio theater production called In Freedom's Cause. This audio drama will cover the story behind the life and legacy of William Wallace and Robert the Bruce. Visit the In Freedom's Cause website or Facebook page for more information. Click here for more Under Drakes Flag reviews (many different products were reviewed) from the The Schoolhouse Review Crew.